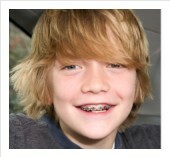 Orthodontics is the dental specialty that corrects irregularities of the teeth, jaws and face. The orthodontist is the dental specialist who diagnoses, prevents and treats dental and facial irregularities. Orthodontists specialize not only in the cosmetic appearance of your child’s teeth but also in the overall health and long-term functioning of the teeth and jaws. Orthodontists receive an additional two to three years of specialized training beyond dental school to learn the proper way to align and straighten teeth. Only those with this education may call themselves “orthodontists” and only orthodontists are eligible for membership in the American Association of Orthodontists. Dr. Car Edwards is a member of the American Association of Orthodontists and thanks you for placing your confidence in her to treat your child’s needs. It's never too late to straighten your smile. Contact us today. We believe we have an important role in your life and/or the life of your child. We strive to provide the highest quality orthodontic care in a friendly and caring environment. Through our teamwork we are committed to making a difference in every patient’s life by creating a beautiful smile. Dr. Carol P. Edwards specializes in dentofacial orthopedics and orthodontics. Visit our Promotions page to learn about our current promotions. "Dr. Edwards was very nice and caring. She worked with me to make my visit relaxing and comfortable! Thank you to everyone!"